I thought that this birthday card was rather appropriate for today. 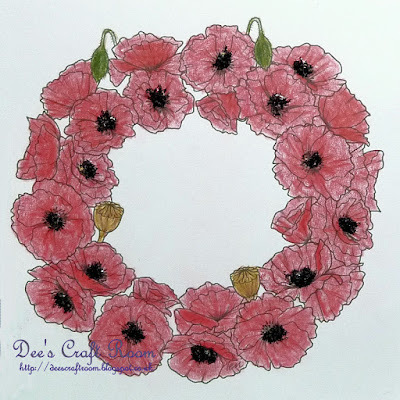 This fabulous poppy wreath image is from Delicious Doodles. 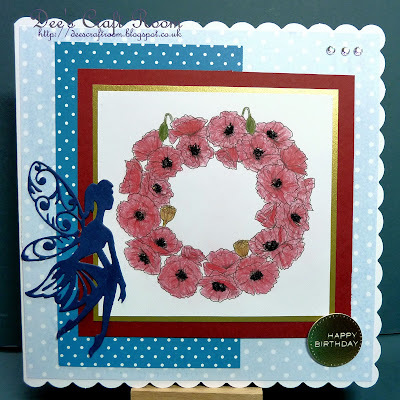 I coloured the wreath with my polychromos pencils and mounted it on gold miri card and red card. The polka dot backing papers are from my stash, as is the die cut fairy. The sentiment is a Craftwork Cards one. Thank you Carol. I have this card saved in my draft folder for ages, it just seemed to be the right day to post it! Thank you Mrs Beez. Have you ever done something when you made a card and not really known why? Well, that was me and the fairy, I don't know why I put her there put it just seemed to be the thing to do, sort of tragedy and hope. I was disappointed with the colouring but the pencils would not cover well, I wondered if it had something to do with the card I had printed it on.